Letting children wear winter jackets in car seats is a common mistake. Read on to learn more about why you should remove thick winter clothing before placing your child in the car seat. Also, get six safe alternatives for keeping children warm in a car. At BeSafe, we know that protecting your child and keeping them safe is your number one priority, whether it is in school, on holiday, at home or in this case: in your car. Keeping your son or daughter safe is after all why you have a car seat installed in the first place. So let’s talk about why you should avoid the combination of winter jackets and car seats. As temperatures are dropping and you protect your child against the cold outside with a winter jackets, taking that coat off before going on a drive is not necessarily something that comes to anyone’s mind. That is why we as a car seat manufacturer do what we can to get the following message across each year before winter sets in: In the event of an accident or even just harsh braking, the seat’s harness may not be correctly tightened over the child’s body if they wear a winter jacket. As a result, the car seat cannot keep your child as firmly in place as it is designed to. 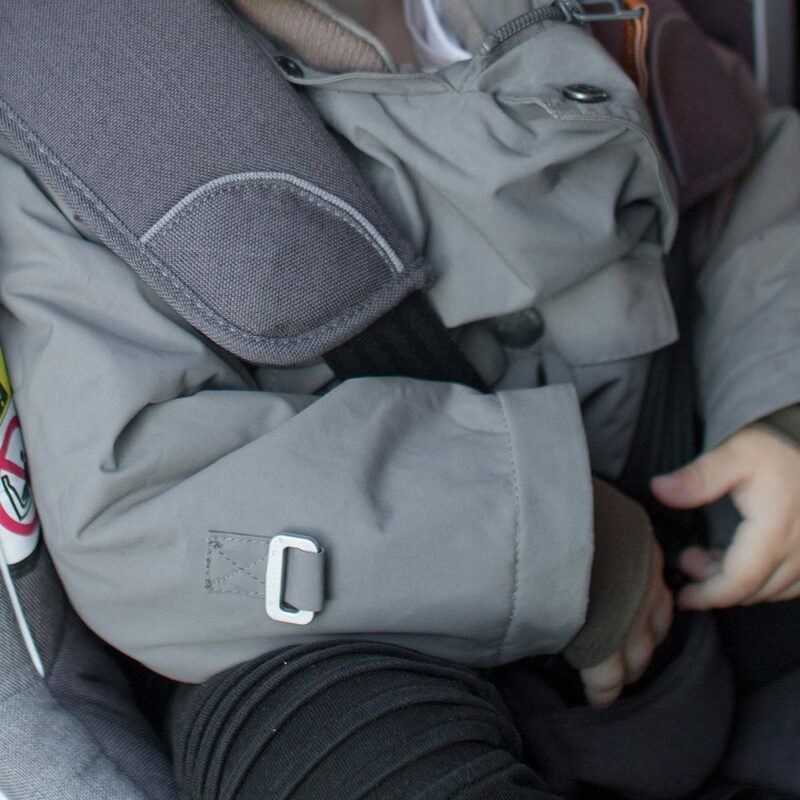 Why are thick winter jackets in car seats dangerous? Most winter jackets have a filling material like down or feathers, which are designed to keep your child warm by creating a thick “air buffer” in between your child and the cold air outside. However, when placing your child in the car seat with such a jacket on, the coat’s thickness can prevent you from tightening the harness close to your child’s upper body. On this picture, it looks like the harness is tightened well and that it cannot be pulled any tighter. When keeping the same harness settings and then taking the jacket off, it becomes clear that there is a lot of space between your child’s upper body and the harness. In contrast, this picture shows how tight the harness should be when buckling up your child correctly. In the event of an impact where your child is pushed out of the seat and into the harness, the forces are so strong that the air in the coat is released. This results in your child having too much space for movement, as the harness is not tight enough to hold them back securely. Thus, when travelling with children in winter, we strongly encourage you to avoid having them wear thick winter jackets. How to prevent my child from being cold in the car? 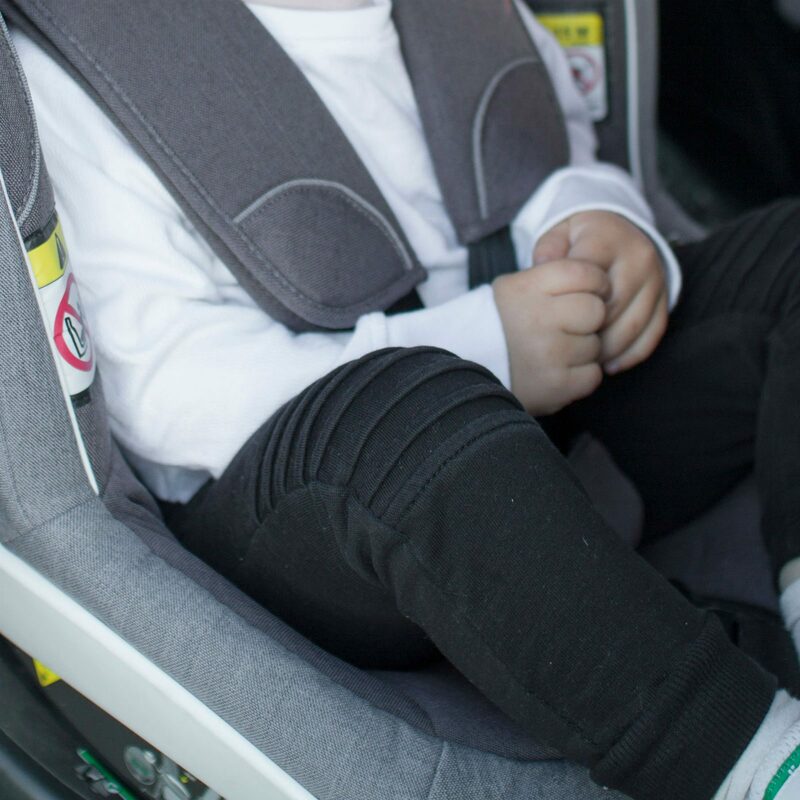 Footmuffs specifically designed for being used with baby car seats have back openings and pre-cut holes that allow placing the harness on the inside in its correct position. 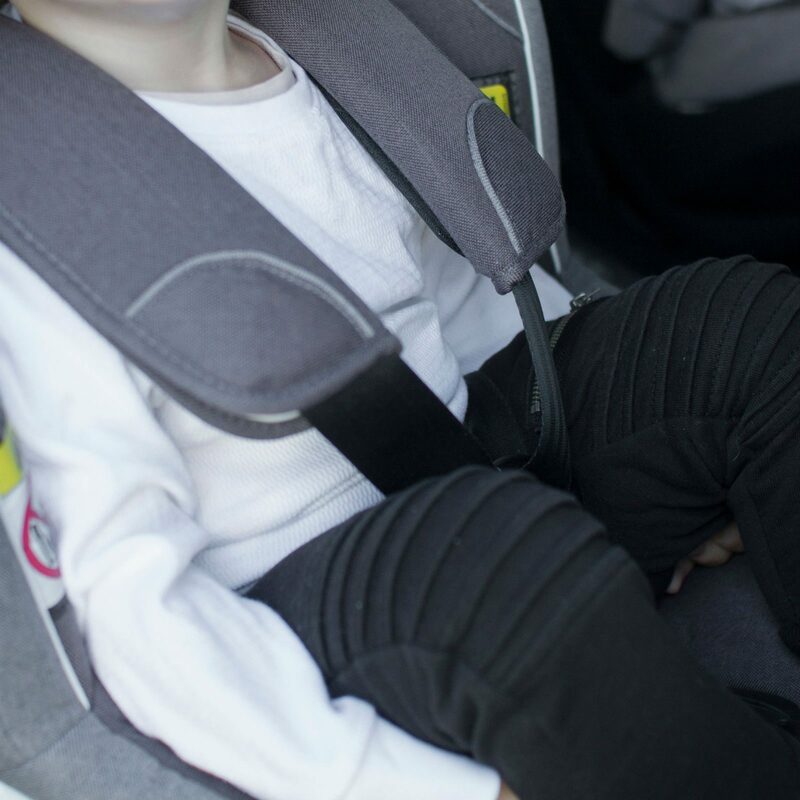 As these footmuffs are closed above the harness and have non-compressible material like wool in the back, no puffy layer is added between your child and the seat’s harness. By placing a hot water bottle into your child’s car seat five to ten minutes before departure, you can easily ensure that they are not sitting on a cold surface. Instead, they are even receiving extra heating from below. This suggestion was contributed by BeSafe car seat users, thank you! These materials offer good isolation properties without being so thick, so that the harness can be tightened properly. Place your child into the seat without the jacket and buckle them up tightly. Afterwards, you can put the jacket on ‘the wrong way around’ by putting it over the arms and laying it over their upper body. This way it can still protect from the cold air without being placed in between your child and the harness. Allow your child to snuggle up with a blanket that is placed over them after buckling up. This allows them to be warm and cosy but still travel safely during the whole journey. If your child is wearing a poncho, you can place the part that is hanging over their back over the child car seat and the front part above the harness. This way you can create a ‘warm bubble’ underneath the poncho and still ensure that no thick layer prevents the harness from being tight. Alternatively, the same can be achieved by taking a blanket and cutting a head opening into it. Please make sure though that the back part of the poncho/blanket is laying loosely on the car seat and is not stuck anywhere. This suggestion was contributed by BeSafe car seat users, thank you! 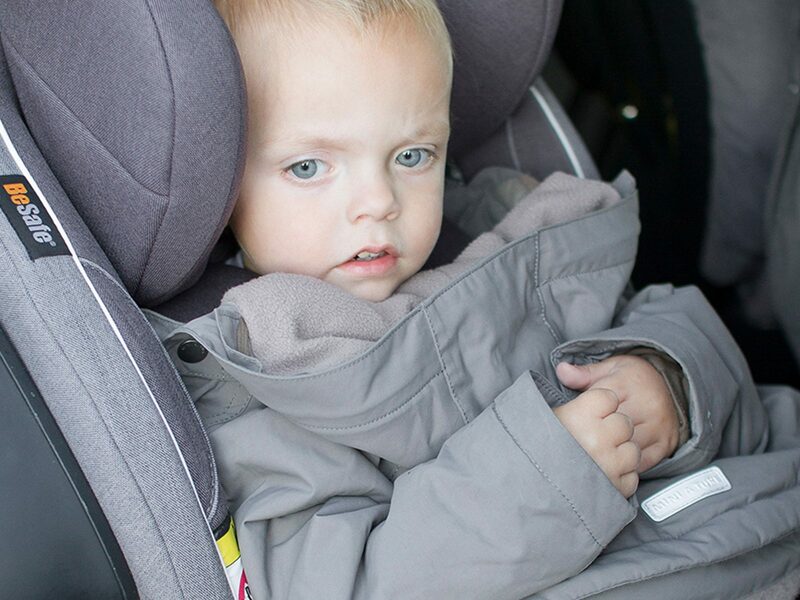 Do you know someone who should know about not using winter jackets in car seats? One way of making more parents aware of the danger is by putting up posters in your day-care or by handing them out as flyers. To make spreading the word easier for you, we have prepared a poster for you that you can download and easily print out at home. Thank you for helping to spread the word! With your help, more children will travel safely during the cold winter months.